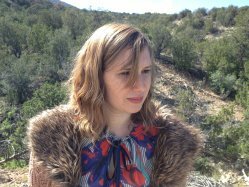 Andrea Rexilius’ publications include three books of poetry: New Organism: Essais (Letter Machine, 2014), Half of What They Carried Flew Away (Letter Machine, 2012), and To Be Human Is To Be A Conversation (Rescue Press, 2011), as well as the chapbooks, Séance (Coconut Books, 2014), and To Be Human (Horseless Press, 2010). Andrea is Core Faculty in Poetry, and Program Coordinator, for the Mile-High MFA in Creative Writing at Regis University. She also teaches in the Poetry Collective at the Lighthouse Writers Workshop in Denver, Colorado.